Michael Davidson, aka the Grilled Cheese Guy, has a life that runs like a screenplay. After moving to the Bay Area to pursue a career in medical diagnostics, he hurt both his hands in two freak biking accidents. His day job soon became too physically grueling and he needed an out. When a national grilled cheese competition came to town, Davidson thought, "By gosh, maybe this is my chance!" On a wing and a prayer, with a surplus of elbow grease and moxie, he went all in … and lost. Don't worry: Even the Karate Kid got beat up a few times before winning the title. 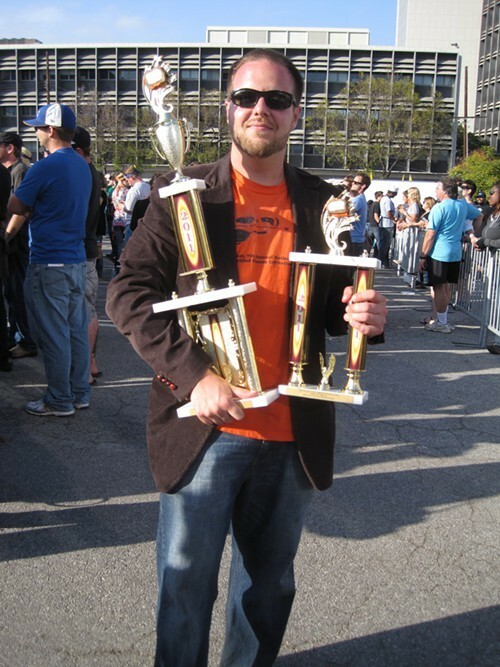 Davidson upped his grilled cheese game and returned to the competition the following year, earning the first-place trophy! Roll credits? Not so fast. After taking home his trophy, Davidson started hustling around the Bay Area in his Honda Fit, catering private events and popping up at festivals. He did quite well for himself, gaining a loyal following and several more national trophies, and launching a popular mobile food showcase called Behind the Cart. Happily ever after? Not quite. Not content to be merely a scientist, or a grilled cheese guy either, Davidson once again has taken an unexpected career twist. Apparently after his day job and his night job are through, he stays up until the wee hours banging out short stories, scripts, and screenplays. As it turns out, the grilled cheese thing was a bit of a smokescreen, a way to launch Davidson into his real career goal: writing science fiction. Now, the Oakland resident has dreamed up his biggest idea yet. And he won't rest until he's pitched it to writer/director/producer J.J. Abrams. In a shameless bit of self-promotion (in which I am now complicit), Davidson is leveraging the power of his social media following to attract Abrams' attention. Like Robert Gibbs, the overweight Livermore man who recently used the viral impact of YouTube to connect with Dr. Phil, Davidson is sending his plea out into the universe. "Hey Grilled Cheese Guy, I like all your ideas." "Food was never my end goal," said Davidson. "Now that I have 1,000 grilled cheese-loving followers, I'm using that power as a ploy to achieve what I really want." His pitch to Abrams will consist of two simple questions. 1) What is something tangible (think bullets or petroleum, not war or hunger) in the world that you would want to disappear? and 2) What is something you would never want to disappear? Davidson says these questions abstractly sum up his idea for a mysterious new TV series, and they are sure to pique Abrams' notorious curiosity. Despite being a reluctant Twitter user, Davidson recognizes its inherent power as a social connector. In the past, he has used social media message-in-a-bottle strategies to connect with Goldie Hawn ("I thought she was dead!") and to get free passes to the Macworld convention. And until his followers help get Abrams on the phone, Davidson is going on strike. Okay, technically it's a virtual strike, and he's simply shutting down his website, Facebook, and Twitter pages. If you need any grilled cheese cooked at an event, feel free to give him a call: 510-502-0757.